Is the Air Quality in Beijing Worse Than Ground Zero's After 9/11? A survey of public health experts reinforce just how bad the Chinese capital's pollution crisis has become. When I moved to Beijing from New York in February to study Chinese, a question began to haunt me: Could Beijing’s air in 2013 be more dangerous than the toxic brew produced by the 9/11 attacks on New York City’s World Trade Center, which hung over Lower Manhattan for months, sickening thousands of firefighters, recovery workers, and ordinary New York residents? Every morning, I would wake up in my apartment in central Beijing barely able to see the buildings across the street. Then, I would check online for postings from the U.S. Embassy in Beijing, which uses a device on its roof to measure air quality each hour of the day. Despite intensifying media coverage of Beijing’s bad air—especially around the “airpocalypse” in January, when pollution levels in Beijing climbed well above the United States Environmental Protection Agency’s (EPA) upper threshold for air that is hazardous even to healthy adults—I often found myself at pains to express to friends just how alarmed I was by the air outside my window. My friends in the U.S. could not seem to fathom it and my Beijing friends seemed used to it, even numb. As a native New Yorker, in addition to being the life-changing tragedy and wake-up call that it was for every American, 9/11 was what I considered the worst air pollution disaster of my lifetime. Could that experience help put the severity of Beijing’s air pollution into comparative perspective? Since, even after returning home, the question would not leave me, I decided to look into the comparison. So I spent the summer asking the scientists and doctors who studied 9/11’s environmental and public health impacts how they viewed the air in Beijing. Specifically, I asked them what I knew was a scientifically unorthodox question: Based on everything you know, is a child better off breathing the air in the middle of Beijing last winter or the air within a mile of Ground Zero in October 2001? Which air would you rather breathe? Some of the experts I interviewed were reluctant to make what they said amounted to an apples-to-oranges comparison—the origins, chemical composition, and manner of exposure to the bad air in the two cases makes it difficult to draw parallels. And yet, other experts I spoke to said that if given the choice between breathing the air in Lower Manhattan around Ground Zero in the weeks after 9/11, when it was still sickening thousands, or the air in Beijing earlier this year, they would choose Ground Zero. The pollution around Ground Zero and the EPA’s failure to warn rescue and recovery workers of its risks ultimately resulted in Congress’ appropriating $4.3 billion in 2010 to cover the cost for ongoing health monitoring and treatment of thousands of patients and compensating approximately 10,000 workers for economic losses already sustained from illnesses they suffered in breathing the toxic air. How bad was the air at Ground Zero in the weeks following the attacks? According to New York City’s report “Addressing the Health Impacts of 9-11,” the attacks on the World Trade Center resulted in “massive combustions of jet fuel and toxic plumes of smoke,” and recovery efforts resuspended particulates including asbestos, metals, glass and volatile organic compounds, among other hazardous materials. The air sickened not only firemen and recovery workers who worked on the site of the collapsed towers, but also students at nearby schools and residents of Lower Manhattan who suffered a host of ailments including headaches, asthma, nausea, and breathing problems. 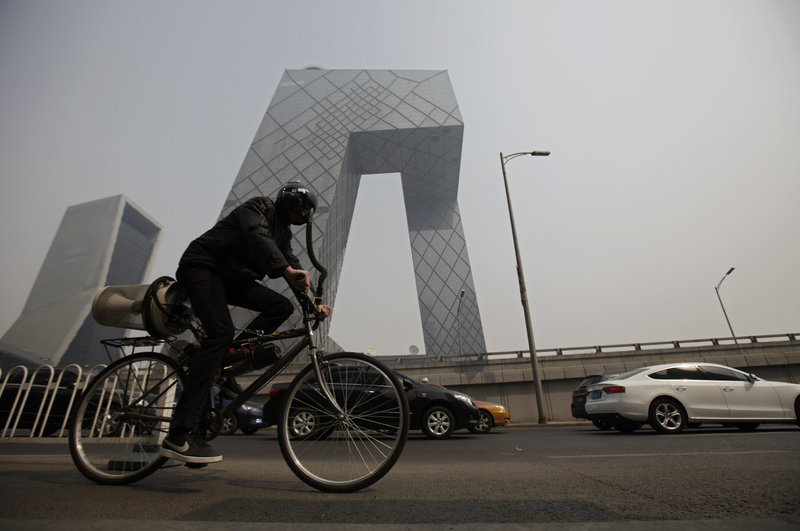 In the photograph at left, Chinese commuters wear face masks as they pass by the CCTV building during heavy air pollution in Beijing on January 30, 2013. At right, a view of the wreckage of the World Trade Center seen through a broken office window, Sept 25, 2001, two weeks after the terrorist attacks that brought down the towers. 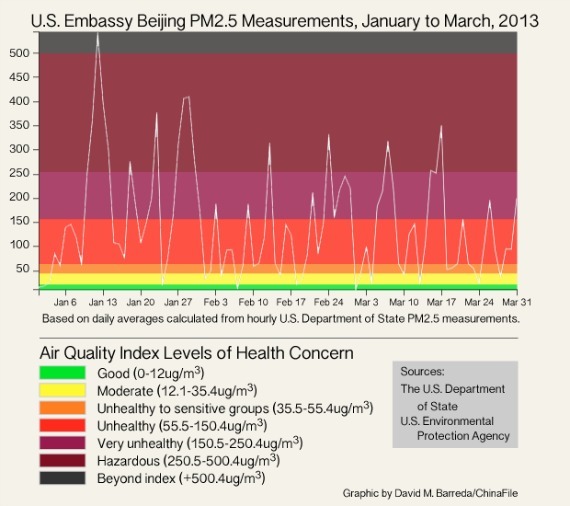 In Beijing, where pollution from burning coal and diesel emissions is severe, the machine on the U.S. Embassy’s roof monitors “PM2.5”—the airborne concentration of particles 2.5 microns in diameter (1/30 the width of a human hair) or finer, whose size allows them to travel deep into human lungs (and even into the bloodstream) where they can cause a range of serious health problems, including cancer and cardiovascular disease. While many of the health problems New Yorkers and rescovery workers suffered after 9/11 were due to coarser particles—blasted shards of glass, pulverized cement—or to gasses, scientists around Ground Zero also monitored PM2.5, which was an important component of the toxic plume that swept back and forth over Lower Manhattan in the weeks after 9/11. Looking for a point of comparison, I compiled the U.S. Embassy’s readings in Beijing for the months of January through March and showed them to the 9/11 experts I interviewed. “It’s not a simple mass-based comparison,” agreed Dr. Jonathan Samet, Director of the University of the Southern California Institute for Global Health at the Keck School of Medicine, who says he has traveled in China on and off for more than 20 years. “The real point,” Samet said, “is that these levels far exceed what is deemed as healthy by any authority. These levels are reaching those at which catastrophe has occurred,” he added, citing London’s Great Killer Smog episode of December 1952, an epic air pollution event in which several days of frigid temperatures in London prompted increased coal-burning and contributed to the immediate deaths of approximately 4,000 people. Even if some of the experts I interviewed were disinclined to view Ground Zero as a meaningful comparison point for Beijing, none of them told me the air in Beijing was better than the air around Ground Zero and there was no disagreement over how poorly Beijing compares to America’s most notoriously polluted cities. More recent comparisons of Beijing to United States cities are more striking. “I was in Los Angeles when some bad forest fires occurred, and the air quality was bad—but still better than an average day in Beijing,” wrote Beijing-based environmental consultant Steven Andrews in an email. “PM2.5 levels during those fires reached up to 350 … This January in Beijing, PM2.5 concentrations reached above 600 (24h average) and 900” in a single hour. “I am not one of these sky is falling kind, but here the sky is truly falling full of particulates,” Moline said as she reviewed Beijing’s PM2.5 data from January to March. So, if “the sky is truly falling,” what responsibility is there to warn people and their children about the dangers? Chinese government officials, like politicians throughout the world, may not be eager to stress a problem at home, and China’s own Air Quality Index has higher thresholds for what constitutes unhealthy air than the EPA―which itself was roundly criticized for years following the September 11 attacks after scientists and doctors, including some I interviewed, forced the agency to admit that it had severely understated the severity of the pollution disaster at Ground Zero in its reports on the air being breathed by residents and recovery workers. The U.S. Embassy in Beijing publishes hourly readings and charts of the air quality in Beijing and four other Chinese cities on its public website, yet, currently, it only provides this information for the previous twenty-four hours, and then the data is removed. “Although we do not currently disseminate historical data to the general public, we make hourly data publicly available,” U.S. Embassy Deputy Spokesman Justin Higgins explained to me in an email. It is not available after 24 hours, except if one accesses the Embassy Twitter feed and looks for the information hour by hour, tweet by tweet. That’s what I did to collect the data I showed the experts I interviewed because the U.S. Department of State only provided some of the archived public data I requested for this story two weeks before press time. “We are working to make all historical data publicly available on the web and hope to have more current data to share shortly,” Higgins told me. That will make it easier for the public to track trends. But this kind of easily available and increasingly comprehensive information also makes living in Beijing that much more of a daily dilemma. But even with more information, knowledgeable people are still choosing to live in Beijing. On August 4, New York Times Beijing correspondent Edward Wong wrote anaccount of the daily dilemma he now faces asking his wife and young daughter to live every day in air that may or may not be apples-to-apples worse than Ground Zero on September 12 but certainly is no better. Before this assignment, I spent three and a half years reporting in Iraq, where foreign correspondents talked endlessly of the variety of ways in which one could die — car bombs, firefights, being abducted and then beheaded. I survived those threats, only now to find myself wondering: Is China doing irreparable harm to me and my family? The environmental hazards here are legion, and the consequences might not manifest themselves for years or even decades. The risks are magnified for young children. To drive home Wong’s point, the Times illustrated his essay with a blow-up color picture of an infant breathing through a mask at a Beijing hospital. The photo covered almost the entire front page of the paper’s Sunday Review section, an image that inescapably brings to life those readings from the Embassy roof. This fall, nobody is forcing me to return to Beijing, which, after all, is only China’s ninth worst-polluted city. But the trade-off—the world’s most fascinating, emerging country versus the world’s most threatening environment—is worth it. So, I’m returning for another semester of language study, and to immerse myself in all things China—well, except for the food, water, and air. I’m returning with a full supply of N95 respirator masks and air filtering machines, and even more determination to use them. Emily Brill is a journalist and native New Yorker.